Several scenes that I'd remembered writing (and re-writing) weren't there. Gone with them were a handful of minor characters. Over the course of writing it, I completely overhauled it at least twice. Originally I was going to alternate time between Del's rookie season in the big leagues with scenes from the past that led up to or were somehow related to each "current" event. But playing with time get tricky and can blow up if not done right. I wasn't convinced I was doing it right, so I reworked the timeline into chronological order. After the second major draft I recast Del's parents and girlfriend. They were all too cliched, overused, boring, lame, and predictable. I hated them and they deserved to die. So they died, and were replaced with originals. I especially loved Del's new dad, Milo, whose back story of a life-altering spinal tumor was based on the experiences of a good friend. I found Milo a job as a tender on a bascule bridge over the Lake Washington Ship Canal, and daydreamed myself about working there some days. I set his mother up as a bartender with secrets of her own to guard. I beset his relationship with his girlfriend with as many realistic challenges as I thought it could bear. And then some. And in the end the supporting cast felt worthy of what otherwise seemed to me to be an original plot, about a baseball player who gives in to the temptation to use illegal performance-enhancing drugs and then must deal with the consequences when his secret is exposed. I'm not alone in regarding Nine Bucks a Pound as my best work. Not that I put too much scientific stock into Goodreads ratings, but of my four novels, it has the highest rating at 3.97 (out of 5). Though if you want to get scientific, it has a significantly smaller sample size than The Greatest Show on Dirt or Sorry I Wasn't What You Needed. And this is the part that frustrates me. It's had correspondingly smaller sales, as well. I imagine part of that may be due to the subject nature. Books about baseball only appeal to the segment of readers who like baseball enough to want to read a novel about it. 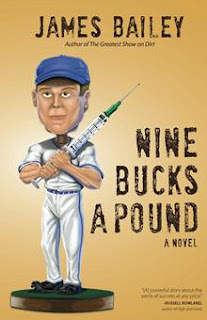 On top of that, this book is about steroid use, which most baseball fans want to forget ever happened. The Greatest Show on Dirt was easier to market, thanks to connections I had down in Durham, N.C., where it was set. I never realized just how good I had it when I released that as my debut back in 2012. I've never come close to matching the publicity I got for Dirt. Sorry I Wasn't What You Needed appealed to enough readers in the Jonathan Tropper fan camp to garner some nice reviews when I released it in 2015, but even that hasn't caught up. Poor Nine Bucks a Pound has never found much of an audience. If you're in the majority of the 7 billion people on the planet who haven't read it yet, I've got an offer for you. Download a free copy from Book Funnel. Read it on whatever ereader device you use (Book Funnel will let you select when you download it). If you enjoy it, write a review on Amazon and/or Goodreads (and bonus points for actually writing a couple of paragraphs, not just giving it a number rating, which though nice doesn't really do much to convince other potential readers they should give it a look). Consider it my Christmas gift to you. In return, if you enjoy it, you can respond with a nice New Year's boost for me. Cheers!